Did Best Buy flip the $99 switch too early on the HTC Flyer? According to a memo that is flying out to associates now, that is most certainly the case. 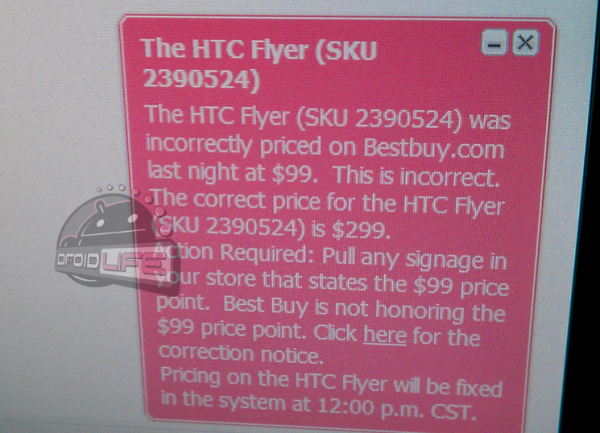 It appears has if the wrong SKU was entered for the device and should still be at $299 for the time being. The question now is, “Will they honor all of those orders at $99?” No word yet, but you will want to cancel the trip you just planned to your local Best Buy. Or at least call ahead to see if they will honor that price. Update: Still no word on if online orders are being honored, but we know that they are definitely turning folks away at stores. Do not make the drive to your local Best Buy today.